An old philosophical riddle asks If a tree falls in a forest and no one is around to hear it, does it make a sound? If your concerns revolve around weighing scales, the riddle could be changed to If a scale weighs items very precisely, but it’s hard to use the scale or read the display, does it really work accurately? A scale is only as good as the information that you can obtain from it. Of course, you do need to start with an accurate piece of equipment. Industrial scales must use load cells that are accurate and rugged. 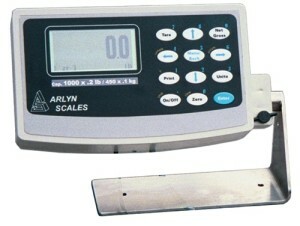 Many electronic scales include load cells that are made from aluminum. Some of the better scales use plated steel load cells. The highest quality devices, like the Arlyn Scales line of scale products, use stainless steel load cells. Precision US vendor strain gages are installed on these high grade transducers. A silicon coating protects the strain gages from moisture and other environmental hazards. The resulting load cell is accurate and rugged. They will withstand overload and shock loading, which occurs in many industrial situations. The electronic digital converters must also be accurate and stable. These converters process the very small signals from the load cell into digital information that can be processed. Some scales use amplifiers to boost the load cell signal to a higher value. Unfortunately, these amplifiers and their related components are prone to drift when the ambient temperature changes. The best scales use precision analog to digital converters with drift free internal gain to avoid this problem. Once a digital value is determined, the electronic scale must now provide a way for the scale user to receive this information. The most common user interface is a numeric readout which may include LED numbers and indicators. The primary disadvantage of LEDs is that they may be difficult to read in areas with high levels of illumination. This is particularly true in outdoor locations. A preferred readout utilizes LCD digits. These may be backlit for areas with poor lighting. But the display will not look washed out when the scale is used in areas with very bright lighting, or even with bright sunlight. While an LCD numeric display can provide basic weight information, it may be cumbersome to obtain other types of information. That may include tare weight values, piece weight values for parts counting scales, and part numbers. Another type of information that could be useful is the type of unit that has been chosen, such as pounds, kilograms, ounces, or grams. It is also useful to know if the weight shown is a gross value, or a value that has been tared. It can become difficult for a numeric display to show all of these parts. Even an alphanumeric display may be challenged. The most appropriate display type for a digital scale is a graphics display. This can change the size of various readouts depending on how much space can be allocated to the value at the current time. If the only value needed is the weight on the platform, the digits can be quite large. If the piece weight and piece total must also be viewed, all of the numbers should be adjusted to smaller digits. Arlyn Scales provides graphics displays to help the user obtain all of the information that is necessary or useful. Besides simply showing the information on the industrial scale itself, it can often be essential to transfer this information to a computer system. There are a variety of methods that are used for this purpose. One of the oldest, and most common, is RS-232 serial data transfer. The difficulty with this method is that most computers no longer provide this type of interface. Instead, they have changed to data transfer methods using USB, or Universal Serial Bus. Arlyn Scales does provide this choice as an optional communication interface. Another method employs the industry standard Ethernet protocol. Again, Arlyn Scales offers this option, along with software that may be used with the computer to accept the data. It is also possible to make the weight data available to other computers on the Internet, if the user has been authorized to receive that data. This can be particularly useful in situations where the industrial scale must be monitored from a remote location. Drum scales that provide chemicals for various industrial applications are a very common application for remote monitor requirements.